Best Denture Glue - which 5 denture adhesives do dentists recommend? Asking people which is the best denture glue or the strongest denture adhesive is a bit like asking which is the best deodorant. Every denture wearer has their own opinion! But, after almost 40 years of clinical experience as a dentist in 5 countries around the world, I think there are just FIVE denture glues worth considering. They are DEFINITELY better than most denture adhesives on the market. And there's a NEW entry, developed by a dentist, that has everyone talking. Read on! As a dentist, I am going to tell you the 5 best denture adhesives available that I know of. Then you need to try one or two of them to see which one suits you best. I have been dealing with denture wearers for over 35 years, and know from my own personal experience and research which is the best denture glue! You're probably thinking - "Well, if my denture fitted properly, I wouldn't need a denture adhesive!" Actually, the better the fit of your denture, the better a denture glue will work! We'll take a look at the "how and why" of denture adhesives in a few minutes, further down this page. But first . . . Those reviews. STOP PRESS - STOP PRESS - January 2018. There's a BRILLIANT NEW denture glue that's just launched, called ADHESADENT, from Dr. B Dental Solutions. GO TO MY NEW PAGE AT Best Denture Products by Dallas dentist Dr. Lorin Berland. You can get a 20% discount on ALL the products, AND a FREE sonic denture cleaner! BACK to MY denture glue review list. This is my list of the BEST denture adhesives, based on my experience AND what my patients have told me over the past 35 years! This list is based on real patients giving real opinions and feedback for almost 4 decades. I have ignored online reviews and website-based information, because the writers are either not dentists or they are just trying to sell you a product. IN FIRST PLACE - I think the best denture glue is DENTEK SECURE, (in the USA, Canada and the U.K.), which is also marketed under the name Fitty Dent in most other countries around the world. It claims to be the only non water-soluble denture glue. This means that it doesn't dissolve in saliva, and so it doesn't wash out from under your denture over time as the day goes by. It lasts and lasts. Dentek Secure was originally developed for troublesome LOWER full dentures - the most difficult denture situation, because the lower jaw line where the denture sits is much smaller than for an upper denture - there's not much for the lower full denture to grip onto. Of course, if it works well for lower dentures then it will be even better for upper dentures! An important point is that because the material does NOT wash out from under the denture, you are also NOT swallowing the adhesive bit by bit over the day. Much healthier! Dentek Secure is available as a paste OR as wafers. It is also free of zinc. I think that the PASTE is the BEST DENTURE GLUE. My patients who use Dentek Secure tell me that it works EXTREMELY well, and that it does indeed last all day. I would strongly recommend this paste, because you can get a really thin layer inside the denture. It's VERY important to use the thinnest layer possible, because this gets the strongest result! The Secure wafers are also quite thin, but not as thin as a smear of the paste! Here's a link to Amazon for the best deal (which is the TWIN PACK) on the denture paste - just click on the image below! So, DENTEK SECURE is my personal recommendation for a great denture glue. What other denture adhesives are worth looking at? IN SECOND PLACE, close behind, is Super Poligrip. It is a very good product, and shows up very well in many denture adhesive reviews. It used to contain zinc, until May 2010. The manufacturer changed the formula at that point, and any packets manufactured after May 2010 are zinc-free. Some people feel that Super Poligrip has a slightly grainy feel when first applied, but this seems to wear off after a few minutes. Click on the picture below for the best deal on Super Poligrip! IN THIRD PLACE WAS Cushion Grip, until it went out of production in 2015! BUT DON'T PANIC - if you liked Cushion Grip then you'll like a very similar product from Japan called Cushion Correct EZ. It is especially useful where there are spaces under your denture and you're almost at the stage of needing a denture re-line - or even a new denture! Cushion Correct EZ is claimed to last for 4 days at a time. Yes, FOUR DAYS!! You put it inside the denture, wear the denture as normal, then take the denture out at night (but leave the Cushion Correct EZ in place). Then you just go ahead and wear the denture again the next day. After 4 days, replace the Cushion Correct! There is no other denture glue that works like this, nor lasts as long. BUT, some people are not comfortable with leaving the material in place for so long. Also, it is NOT really a denture adhesive - it's more like a denture re-lining material. Here is a link to check prices on this great product - just click on the image; don't worry about all the Japanese writing, the instructions are in English! IN FOURTH PLACE COMES Fixodent Plus. Fixodent denture glue is one of the few denture adhesives that still contain Zinc. My understanding was that the Zinc had been removed from Fixodent products, but according to the Fixodent website, it clearly states that Zinc is still present in the Fixodent products. This is a VERY LOW level, and when used as directed is NOT A PROBLEM. Click on the product image to see the best deal! Here is some information about the Zinc Poisoning problem from a few years ago. Basically, people were using WAY too much adhesive paste in their badly-fitting dentures! Why would you use a DENTURE GLUE? ANSWER - To reduce the movement of your denture on your gums. 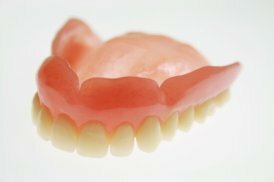 It's possible to have a denture that is actually a really good close fit to your gums, but it doesn't stay in place very well because THE SHAPE OF YOUR GUMS doesn't give the denture much grip. For example, the roof of your mouth (palate) may be rather low and flat, so your denture can't get much grip or suction onto your palate. Your denture can move around on your gums when you are eating, causing irritation to the soft gum tissues, and it will feel loose. On the other hand, if the roof of your mouth is high and arched, a denture will get more grip, and be more secure. In this case, the denture will sit snugly in position, and hardly move at all when you are eating. This is because adhesives work better when they are THIN. You get the thinnest layer if your denture is a good fit to start with! As your denture gets older and your gums change shape, you start to get spaces and gaps under the denture. Using a denture adhesive in this situation may help a bit, but the bigger the gaps, the less well it works. And the more adhesive you need. Even the best denture adhesive will not work as well as it could. Instead of spending more money by using greater and greater amounts of denture adhesive, you would be much better off getting a new set of dentures that fit well. Then you can use a really THIN smear of the strongest denture adhesive, and your dentures will be stable, secure and comfortable. So remember; the best denture glue is always a VERY THIN LAYER of your favorite product. I hope this look at the strongest denture adhesive reviews has been helpful! I've also written instructions for Cleaning Your Dentures which you may find useful. Many people tell me they are surprised by some of my recommendations!